Two Hundred Dollar Gift Certificate. Two Hundred Dollar Gift Certificate. 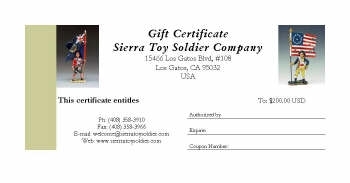 Available for use for any on any product in either the Sierra Toy Soldier Retail Store or at our website. Cannot be redeemed for cash. Please choose if you wish the certificate mailed or emailed.